Ch. 10:32-33. "Whosoever therefore shall confess in Me before men, him will I confess also before My Father Who is in heaven. But whosoever shall deny Me before men, him will I also deny before My Father Who is in heaven." He exhorts them to bear witness even unto martyrdom. For belief only within one's soul does not suffice; He desires also the belief confessed with the tongue. He did not say, "Whosoever shall confess Me," but "in me," that is, in My strength. For he who confesses does so aided by the grace which is from above. But as for him who denies, Christ did not say "in Me," but "whosoever shall deny Me," showing that he denies because he does not have the aid from above. Therefore everyone who confesses that Christ is God will find Christ giving confession of him to the Father, that he is a true servant. But those who deny will hear the words, "I do not know you." 37. "He that loveth father or mother more than Me is not worthy of Me: and he that loveth son or daughter more than Me is not worthy of Me." 38. "And he that taketh not his cross, and followeth after Me, is not worthy of Me." Whoever, He says, does not renounce this present life and give himself over to shameful death, for this is what the cross signified to the ancients, is not worthy of Me. But since there are many who are crucified, such as robbers and thieves, He added, "and followeth after Me," that is, live according to My laws. Ch. 19:27. Then answered Peter and said unto Him, "Behold, we have forsaken all and followed thee; what shall we have therefore?" Even though it seems that Peter had not forsaken very much, as he was poor, understand that in actuality he, too, forsook much. For the fewer possessions we have, the greater the attachment. But Peter also rejected every worldly pleasure, even natural affection for his parents. For these passions war against the poor as well as the rich (1) What then does the Lord answer? 28. And Jesus said unto them, "Verily I say unto you, That ye which have followed Me, in the regeneration when the Son of Man shall sit on the throne of His glory, ye also shall sit upon twelve thrones, judging the twelve tribes of Israel." Surely they will not be seated? (2) Of course not, but He indicated by means of a throne the great honor they will enjoy. Will Judas also be seated? No; for Christ said, "which have followed Me," that is, "followed Me to the end," but Judas did not follow to the end. By a different interpretation, God often promises good things to those who are worthy. But if they should change and become unworthy, as Judas did, those good things are denied. Similarly with more menacing things, He often threatens but does not carry out the threat, because we have repented. 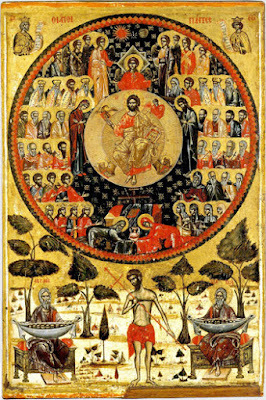 By regeneration understand the resurrection of the dead at the Last Judgement. 29. "And every one that hath forsaken houses, or brethren or sisters, or father, or mother, or wife, or children, or lands, for My name's sake, shall receive a hundredfold, and shall inherit everlasting life." So that no one would think that what was said applied only to the disciples, Christ broadened the promise to include everyone who does likewise. They will have, instead of family of the flesh, intimacy and brotherhood with God; instead of lands, Paradise; instead of houses of stone, the heavenly Jerusalem; instead of a mother, the venerable mothers in the Church; instead of a father, the priests; instead of a wife, all the faithful women, not in marriage—far from it!—but in affection and spiritual relation and compassionate care for them. The Lord does not bid us simply to separate from our families, but only when they impede our piety. In the same manner, He bids us to despise even our own life and body, but not with the result that we slay ourselves. See how good God is: He not only gives us these good things, but adds to them eternal life. You, then, O reader, hasten to sell your possessions and give to the poor. Possessions are, to the wrathful man, his anger; to the fornicator, his disposition for debauchery; to the resentful, his remembrance of wrongs. Sell these things and give them to the poor demons who are in want of every good thing. Return the passions to the creators of the passions, and then you will have treasure, which is Christ, in your heaven, that is, in your mind which has been exalted above this world. For he who becomes like the heavenly One has heaven within himself. 30. "But many that are first shall be last; and the last shall be first." Christ is suggesting here the Jews and the Gentiles. For the Jews, who were first, became last, while the Gentiles, who were last, were put first. 1. Natural affection for one's family becomes a passion when it is placed before love of God. 2. In the ancient world, the privilege to sit in the presence of others indicates a high office or rank such as that of a king or one representing him, or of the father in the presence of his children.